It has just come to our attention here at Crystal Information – that in Brazil, unscrupulous Crystal Dealers are turning plain Quartz crystals into what they are calling “Brazilian Bubble Quartz“. They are doing this by taking a small rock pick and then hitting the crystal all over – to give it a old roughened look. Please find an example photo showing Brazilian Bubble Quartz below. My Brazilian contact tells me some of these practitioners are very skilled at it, even making the bottom of the crystals look like it is a naturally occurring formation. Not only that, they are then selling these traumatized crystals as “New Find – Rare Natural Specimens”. We here at Crystal Information feel that these crystals still have their divine energy essence within them. We do not feel any sort of revulsion towards the crystals themselves – rather we are disappointed with the greed driven actions and unethical practices surrounding the creation and “merchandising” of these Brazilian Bubble Quartz crystals. But Why? Why Do They Do This To These Crystals? Good question. What has brought this practice into being – is the very rare Trigonic family of Quartz Crystals. These natural Trigonic Quartz crystals really do have a very wise roughened look about them, with many having the sought after upside down trigonic triangles on the termination faces. These crystals are fairly expensive, especially in Japan where they are highly sought after. Please find a Trigonic Quartz example photo below. Seeing a financially motivated opportunity – it was discovered that by taking a small rock pick to plain Quartz crystals – they could semi replicate that roughened look – calling them “Brazilian Bubble Quartz“. To these people – it is a win/win situation. They get to offload hard to sell crystals at a greatly inflated price, all the while pulling the wool over unsuspecting buyers eyes. Now this practice has just started in the last 3 months or so. It needs to be stopped! 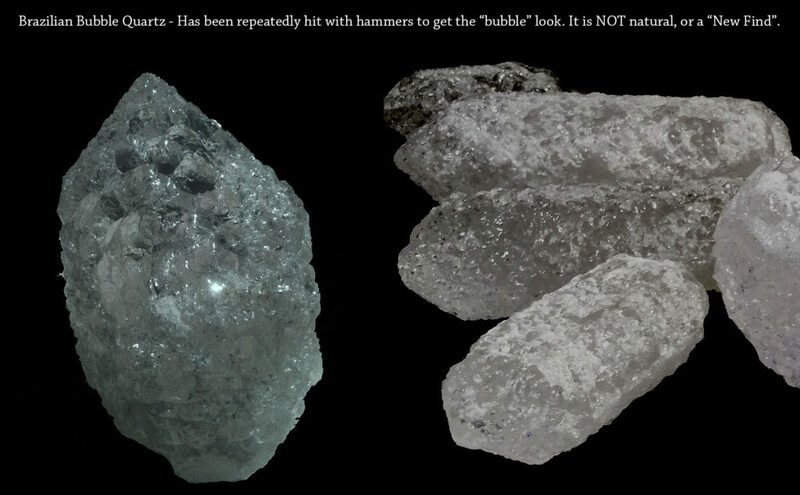 Many dealers are already buying and selling “Brazilian Bubble Quartz“, and yes many of these dealers do actually know what these crystals have been put through – but none the less choose to keep “The Story” going. The only way we see this practice being stopped – is by not buying these Brazilian Bubble Quartz crystals. No matter how much we may wish to adopt and nurture them. As long as there is a market for these crystals, this practice will continue. The crystals can be adopted and nurtured at a later date, but only after they have been left on the shelves unsold for a long period of time. This will force the dealers to heavily discount Brazilian Bubble Quartz in order to get them moved on. Believe us, as dealers ourselves, we know they will not be restocking them again. We hope you have found this article helpful and will spread the word to help stop this type of travesty from occurring further. As ever, your comments are most welcome in the comments field found further below. Greetings and Thank You for sharing your experience. good to hear you are putting out the awesome light energy and not buying into the hype! Thank You again and all the best with your wonderful crystal store! I'm looking for genuine Brazilian quartz crystal from Brazil. Do you sell them and how much are they? I just bought one of these. It arrived today. It was called an 'icicle quartz' from Brazil. I saw your article and pictures and was so sad with the abuse of this crystal. I will let others know. On the flip side I'm glad it found it's way to me . This is a true warrior crystal that needs my TLC. Thank you for sharing – and good on you for taking this crystal under your wing and giving it the TLC it deserves! It is still difficult to imagine doing this to any Earth gift for financial gain. Thank you again for sharing the article. Would have not guessed.